Now you can serve your LEGO guests in the Parisian Restaurant with detailed exterior, dining room, tiled kitchen, apartment, studio, scooter and lots more with this LEGO 10243 Creator Expert Parisian Restaurant Set. It's very busy in the LEGO 10243 Creator Expert Parisian Restaurant. As a scooter zips by, inside the waiter rushes between the tables as the nervous young man gets ready to propose with the ring! It's just as hectic behind the scenes, with the chef busily preparing the food. 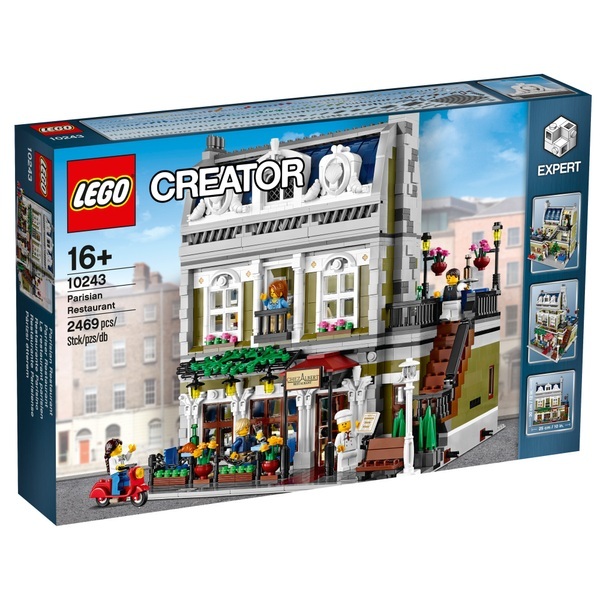 This beautifully detailed building is the setting for so many stories and is a great addition to the modular building series. The Parisian Restaurant has a fully-stocked, blue and white tiled kitchen with tableware as well as a cozy apartment with pull-down bed, kitchenette and fireplace. On the top floor is the artist's room with a studio that includes a cast iron heater, easel, paintbrush and two works of art by the aspiring artist. Outside, stairs lead down to the roof terrace lined with hanginglanterns and flowers where the diners eat alfresco-style. This amazing Parisian Restaurant model even includes a facade with croissants, clams and feather details that recapture the feel of Paris.